El Areeb was bred by William Shively’s Dixiana Farms, a name steeped in Bluegrass history. Dixiana traces to 1877, when Maj. Barak Thomas acquired the property and rechristened it after his successful broodmare Dixie. As fine a matron as Dixie was, Thomas carved out an even greater legacy through other mares. At Dixiana, Thomas bred the classy Himyar from his mare Hira. He named a nearby tract of land Hira Villa in her honor, and it was there that Thomas bred Himyar’s most celebrated son, Domino. Both were known for their high speed. At the time of Domino’s death in 1897, no one could have foreseen his extraordinary influence as a stallion. From only 19 surviving foals* (four of whom were geldings and thus not breeding stock), he became a building block of the American Thoroughbred. And as our bloodlines have gone global, so has Domino’s reach. You’d have to take a deep dive into obscurity to find a contemporary Thoroughbred without Domino in his ancestry; it’s much easier to find him appearing multiple times. El Areeb is no exception to this rule. He’s also a case study in how a youngster can start out as fairly unremarkable, then blossom before your very eyes. Dixiana manager Terry Arnold described the transformation in a February 9 interview on the “At the Races with Steve Byk” radio program. Arnold added that’s a trait his current trainer, Cathal Lynch, has likewise observed. “I thought it was pretty interesting when the trainer made the comment that he was a ‘gym rat,’ because that’s exactly what we saw with him at the farm. He loved to train. At the same time, the gray colt was beginning to fill the eye. “Every week when you’d look at him, he’d get a little more athletic-looking, more round-looking,” Arnold said. “He just kind of came together. At the 2015 Keeneland September Yearling Sale, El Areeb attracted the attention of Dr. Barry Eisaman. With his wife, Shari, Eisaman is well known for success in buying yearlings, developing them at their Williston, Florida, facility, and reselling at the two-year-olds in training sales. The Dixiana-bred checked all the proverbial boxes. Aside from a good catalog page – his immediate pedigree including maternal relatives – were his physical and mental attributes. “Nice and correct, good bone, attractive body, athletic looking, sane,” was how Eisaman remembered his yearling presentation. The psychological aspect is crucial: some “yearlings act all worried about life and squirrelly” in the pressure of the sales environment, with all of the crowds, activity, and noise. If they can’t keep their composure, it’s a potential red flag about their suitability, and Eisaman won’t bid on them. But with El Areeb passing that test too, Eisaman Equine purchased him for $100,000. 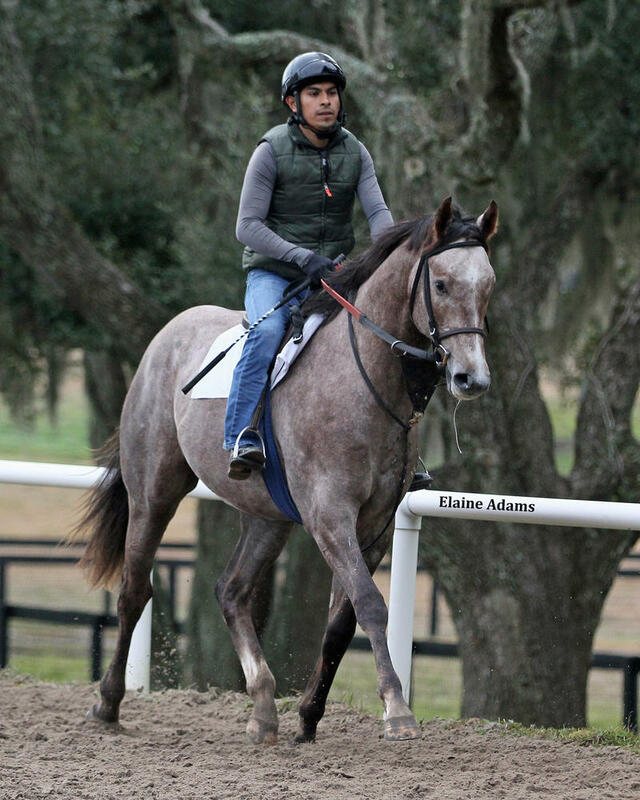 The two-year-old El Areeb flashed that potential to prospective buyers at the under tack show for the 2016 Ocala Breeders’ Sales Company’s March Sale. As though intentionally strutting his stuff to impress, he zipped one furlong in 10 seconds. While El Areeb has the physical skills, it’s his frame of mind that’s taken him to a new level, according to Eisaman. Horses can have all the right physical ingredients, but unless they channel that raw ability into high performance in competition, it’s of little use on the racetrack. That “killer instinct” could take him a long way in the Kentucky Derby (G1), adding another chapter to Dixiana’s history. *For a complete list of Domino's foals, see Abram S. Hewitt's The Great Breeders and Their Methods, p. 53.